I listen to these songs and carols, these hymns and chants, because I long to know what it is I — and all creation — awaits. I listen because I want to know want; I want to grasp what it means to thirst for the living God. “People look east, the time is near, of the dawning of the year…” pipes my car’s radio. This fall, I’ve been practicing looking, not east, but up. My return to teaching after a nine-month sabbatical leave proved to be intensely busy. All too often I’ve been mired in a swamp of details, my concentration tattered and fluttering in the breeze. I abandon an unfinished email and my tea on my desk to answer a student’s question, only to return two hours later to find both my train of thought and tea long gone cold. Late one October afternoon, on a dash to the grocery store, wearily running through what I still had to tick off the day’s list, I happened to look up. The warm sun was washing over the front of the old parish school across the street, and my eye followed the lofty thunderheads piled into soft peaks up and up, untold miles into the atmosphere. My breath caught. The heavens declare the glory of God…. It was as if my tangled, confined heart could reach up and stretch into this gloriously infinite space, into God’s very being. I breathed, no less weary, no less harried, but somehow at rest. Now each time I walk outside, I’ve been reminding myself to look up. To practice stretching into eternity, to extend hands and heart and soul toward the Creator of this firmament that surrounds me, yet does not confine. And each night I’ve been bundling up and going outside. To stand in the backyard, or on the driveway, and look up. The cold brings a sharp serenity to the world outside. I find it seems easier to listen for the still, clear voice of God, to sense the breath of the Spirit stirring in the darkness, to hear the echoes of the prophets in these night hours. To stand in the night to pray has a long history in the Church. As early as the fourth century, St. John Chrysostom spoke of monks who were roused in the depths of the night “to sing the prophetic hymns” and pray. The word “desire” is thought to derive from the Latin siderus, star. Desires come to us from above, descend on us from the stars. Each night, when I venture out, I look up at the stars, a vast spatter of sparkling suns, of which Isaiah tells us that God knows every one of their names, and marches them around the sky like an army. Like the monks of old, I sharpen my ears with the prophetic hymns of Advent. And in the depths of these dark Advent days, I practice looking up. In the Acme parking lot, at the stoplight on the corner of College and Haverford road, in my back yard, on the driveway. That I might see will descend, know what I desire, hear the voice of the One who calls me as He does the stars. The eternal, living God. Emmanuel. God with us. People, look up! 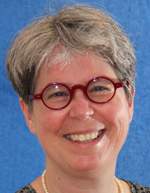 Michelle Francl Donnay is a member of Our Lady Good Counsel Parish, Bryn Mawr. I am delighted to have found you again after the CS&T is gone. Thanks, once more, for your inspirational writing. I will never look at the Stars again in the same way!! !